21/10/11 -- Soybeans: Nov 11 Soybeans closed at USD12.12 1/4, down 12 3/4 cents; Jan 12 Soybeans closed at USD12.20 3/4, down 9 3/4 cents; Dec 11 Soybean Meal closed at USD316.50, down USD3.80, Dec 11 Soybean Oil closed at 51.25, down 14 points. On the week overall Nov 11 beans fell 57 3/4 cents on demand concerns and profit-taking ahead of a crucial week in Europe. Reports of better than expected yields keep on coming. The USDA surprised the market by cutting it's yield forecast earlier in the month, there are plenty that think a national average of 41.5 bu/acre is now too low. A combination of a higher yield and slower than anticipated US sales to China may mean that there is room for some upwards revision in potential 2011/12 ending stocks next month. Corn: Dec 11 Corn closed at USD6.49 1/4, down 1/4 cent; Mar 12 Corn closed at USD6.60, up 3/4 cent. Dec corn posted a modest 9 1/4 cent rise on the week and appears to have found it's level for now. Funds were said to have bought around 5,000 contracts on the day on rumours that more US corn has been sold to China than this week's export sales report suggested. Profit-taking ahead of what is expected to be a busy harvest weekend, and nervousness over the European debt situation kept early price-rises in check however. Some trade talk has China buying Australian feed wheat in preference to US corn at substantially discounted prices. Wheat: Dec 11 CBOT Wheat closed at USD6.32, up 1 1/4 cents; Dec 11 KCBT Wheat closed at USD7.23, down 2 cents; Dec 11 MGEX Wheat closed at USD9.19 1/4, up 1 3/4 cents. Chicago wheat gained 9 1/4 cents on the week, with Kansas up 15 1/2 cents and Minneapolis rising 26 3/4 cents. Chicago wheat has gained on the week due to short-covering rather than spectacular demand. Winter wheat planting on the Great Plains is behind schedule and a hard freeze is expected Wednesday and Thursday next week. US wheat faces stiff competition of the world export stage from the FSU, Canada and Australia. 21/10/11 -- EU grains finished up but well off session highs with Nov London wheat climbing GBP1.00/tonne to GBP147.75/tonne and Nov Paris wheat EUR2.25/tonne higher at EUR187.75/tonne. Nov London wheat was more than a fiver higher at one brief stage mid-afternoon but capitulated later in the day. 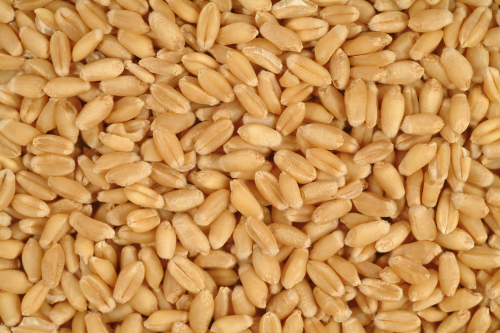 On the week as a whole Nov London wheat ended just GBP1.25/tonne higher and Nov Paris wheat rose EUR3.00/tonne. The pendulum swung marginally back in favour of eurozone optimism today, although anything could have happened by this time next week. 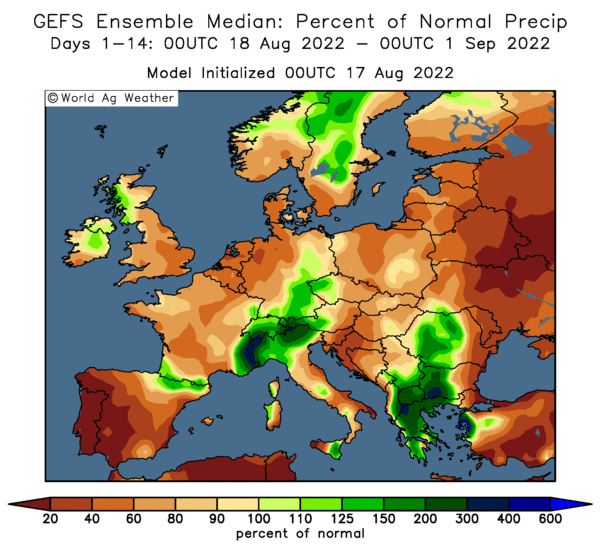 Market fundamentals are turning increasingly bearish (with the possible exception of in the US) with Black Sea wheat already looking increasingly likely to dominate proceedings right through until next harvest. Kazakhstan's harvest is finally just about finished, blowing the previous post-Soviet era production record completely out of the water with silos said to be overflowing and grain being stored in trucks, railcars, anywhere. Ukraine's export duties on wheat and corn officially get lifted tomorrow, and they are likely to waste little time in marketing their wares with a Ministerial record export target of 27 MMT having been set this week. Australia is said to be undercutting US corn prices into Asia (including China) by some USD60/tonne with it's large carryover stocks of old crop feed wheat, before getting cracking with what could be an imminent record new harvest of it's own. 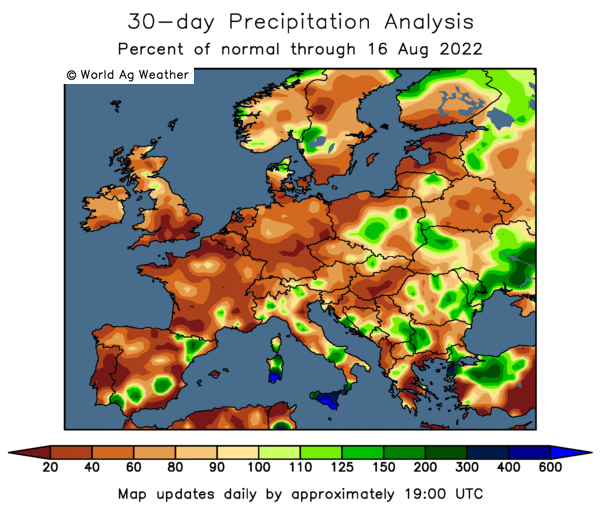 In Europe, wheat demand is slack with ports in the UK's normal top export home of Spain said to be choc-full of wheat, most of it shipped in recently from cheaper sellers in eastern Europe and the Black Sea. Demand for UK wheat elsewhere on the Continent has also gone quiet this week with Czech, Polish and German B wheat appearing onto the market for the first time since June, traders say. Market direction next week then is in the hands of Merkel/Sarkozy et al, will they deliver? They haven't done so yet. 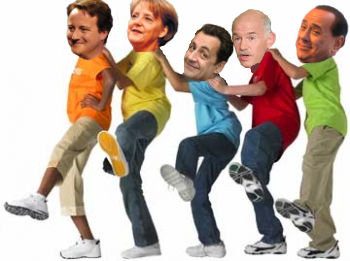 21/10/11 -- The image is inspired by the conflicting reports in the media all week which put me in mind of the Hokey Cokey. You put one trillion in, you do one bail-out, you put another trillion in and you shake it all about...etc. The grain markets are strangely steady ahead of weekend crisis talks for Europe amidst all sorts of rumour and counter-rumour. A deal could be on the table tomorrow is one I've read, this is just a preamble and nothing will be finalised until "Wednesday at the latest" is another gathering popularity. Nobody knows, so I guess we are just going to have to wait and see if 27 debt laden nations, each with their own agendas and a mutual distrust of each other can reach some kind of entente uncordiale won't we? An even bigger question is if they can come up with a decisive plan can they, and will they, have the stomach to carry it through? Because the medicine won't be very palatable that's for sure. Fresh news is thin on the ground, particularly if you're a bull. 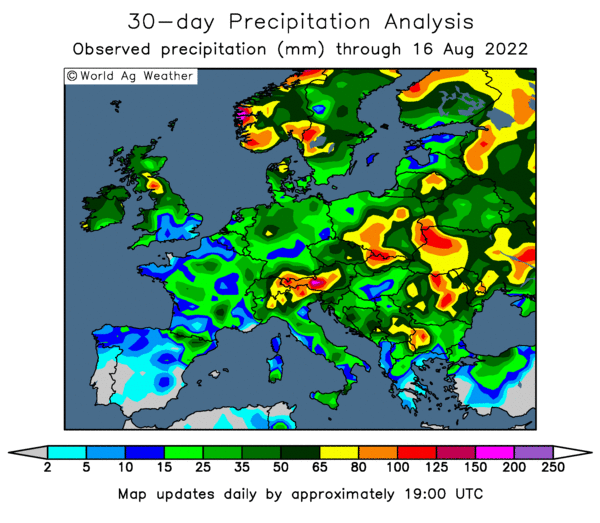 There may be a few weather-related issues for US winter wheat, but what does that matter when FSU crops just keep getting bigger and with that so does export potential out of the Black Sea region. Yet the trade seems relatively unmoved by this so far. Ukraine are expected to commence a heavy export programme now that export duties on corn and wheat get lifted over the weekend. There is now also talk of them lifting VAT on grain exports starting in the new year to help them reach their ambitious targets. Kazakhstan are to commence an aggressive export programme of their own now that their harvest is complete and Russia won't be shutting up shop yet awhile. As we stand, including the overnight action, beans are around 35 cents lower on the week, with corn up 19 cents and wheat around 17 cents firmer. Crude is around a dollar higher on the day. Early calls for the afternoon CBOT session are 8-10 cents higher across the board. 21/10/11 -- The overnight markets are firmer and European grains are a bit steadier too. It seems that we are going to have to wait a bit longer for eurozone leaders to agree on their "cunning plan" - I won't be hanging my hat on Wednesday either. Corn harvesting in France is progressing at a pace and with excellent yields, with Agritel forecasting a crop of 15.5 MMT - 12.4% up on last year and 1.3 MMT more than the USDA estimate. 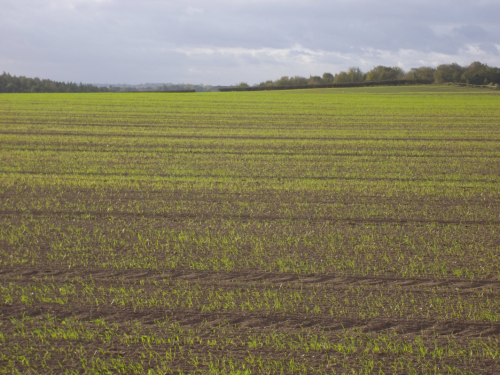 Winter grain plantings are also said to be proceeding well under "excellent" conditions. UK winter crops are also looking well established "up north" with trade talk predicting a record rapeseed area for the second year running. There's no shortage of wheat gone into the ground either up here in God's own county. Demand for UK wheat on the Continent has gone quiet this week my sources tell me, with Czech, Polish and German B wheat appearing onto the market for the first time since June resulting in a slow week for UK exporters. Kazakhstan has just about finished it's harvest now, producing 28.2 MMT of grain in bunker weight. Based on last season's differential between bunker weight and clean weight that would equate to a harvest of 25 MMT, bang on official projections. It could be argued that this season's bumper crop should have considerably less wastage than last year too. Even so 25 MMT would suggest a wheat crop of around 21 MMT, some 2 MMT more than the current USDA number and more than double last season's output. So there's no shortage of Kazakh wheat looking for a home and neither is there in Ukraine. Having set their stall out to attempt to cram record grain exports largely into the final two thirds of the marketing year by waiving duties on corn and wheat sales they are now saying that they're going to cancel the VAT on grain exports starting Jan 1st. For now the market seems strangely relaxed that EU wheat exports (which are averaging around 270,000 MT/week) are unimpressive, and with more and cheaper grain coming onto the market from the Black Sea region that doesn't look like changing. The market also seems to have spent so long witnessing the European debt circus stumble along from one unresolved crisis to the next that another weekend of hot air and posturing is just like water off a duck's back. This disaster has been in the wind for so long now that people are in danger of not seeing it coming, if that makes any sense at all. IMHO. Today's none surprise comes from news that there won't be any blinding flash of inspiration on Monday after all. "EU leaders are to hold another summit by Wednesday, because they will not be able to agree a rescue plan for the euro on Sunday," says the BBC. To concentrate the mind a little, the word on the boulevards this morning is that France might get it's AAA credit rating cut as soon as this afternoon. With an All Black thrashing lined up for Sunday this might not be a good weekend to be French. Mind you, is any weekend a good one to be French? 20/10/11 -- Soybeans: Nov 11 Soybeans closed unchanged at USD12.25; Jan 12 Soybeans closed at USD12.30 1/2, down 3/4 cent; Dec 11 Soybean Meal closed at USD320.30, up USD1.00; Dec 11 Soybean Oil closed at 51.39, down 9 points. 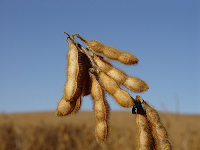 The market rallied from double digit losses in beans early on to end around unchanged at the finish despite funds selling an estimated 4,000 soybean contracts on the day. Soybean weekly export sales were 594,700 MT, well below the 850 thousand MT to 1 MMT anticipated although export shipments of 1,168,900 MT were robust. Spillover strength from corn and wheat helped drag the soy complex up off the lows. European debt concerns remain ahead of this weekend's key meeting. Corn: Dec 11 Corn closed at USD6.49 1/2, up 11 cents; Mar 12 Corn closed at USD6.59 1/4, up 10 3/4 cents. The USDA report weekly export sales of 1.85 MMT for corn, which despite being large was actually lower than the 2.0-2.5 MMT expected with China being confirmed as taking 900,100 MT. In addition there were also sales of 292,100 MT to "unknown" destinations. Sales are running well ahead of last year but actual shipments are more than 25% down on year ago levels. Another big harvest weekend looms, with the weather forecast playing it's part. European debt will be back on the agenda Monday. Wheat: Dec 11 CBOT Wheat closed at USD6.30 3/4, up 11 1/4 cents; Dec 11 KCBT Wheat closed at USD7.25, up 19 1/2 cents; Dec 11 MGEX Wheat closed at USD9.17 1/2, up 6 cents. Wheat export sales were also below trade ideas of 450 to 600 thousand MT at 399,400 MT. EU wheat sales are also lagging as the Black Sea picks up most of the business around, a situation which is unlikely to change any time soon now that Ukraine have lifted their export duties. Market direction next week will be decided by the noises coming out of Europe on Monday. 20/10/11 -- EU grains finished mostly lower with Nov London wheat down GBP0.65/tonne to GBP146.75/tonne and Nov Paris wheat down EUR0.50/tonne to EUR185.50/tonne. We seem to be stuck in a narrow sideways mode at the moment, with London wheat closing within a GBP5.00/tonne band of GBP146-151.00/tonne for the whole of the month so far. That could all change on Monday however depending on how things go in Sunday's summit of European leaders. Early week confidence in decisive action has already given way to an air of resignation that it could just be another load of hot air and posturing, with each side ultimately looking after their own personal interests. Following yesterday's meeting between new Dad and French President Nicholas Sarkozy and German Chancellor Angela Merkel the two main protagonists seem further apart not closer together on the issue. Strategie Grains increased their forecast for this season's EU-27 corn crop to a record 63.4 MMT, and also upped their soft wheat production estimate too. In addition they are forecasting 500,000 ha of land coming out of set-aside to boost plantings here by 700,000 ha for the 2012 harvest. News of Ukraine's President finally approving the lifting of export taxes on wheat and corn met with relative apathy today, which surprises me as I think that this is a major blow to EU export ambitions. Brussels granted 296,000 MT of EU soft wheat export licences in the past week, bringing the 2011/12 YTD total to 4.35 MMT, 44% down on last year and placing us on target only to export little more than 14 MMT this season. EU wheat imports meanwhile currently stand at 2.61 MMT, more than 250% up on this time a year ago. 20/10/11 -- The overnights were mixed, rebounding a little from earlier losses with wheat around 2-3 cents firmer with corn 1 1/2 up to 1 1/2 cents down and beans down 1-2 cents. Breaking news suggests that ousted Libyan leader Colonel Gaddafi gas been captured, and possibly killed. That may see crude oil prices lower this afternoon. Bangladesh has bought 50,000 MT of Indian wheat in a tender as the latter attempts to dispose of some of it's surplus stocks left over from it's last harvest, with another bumper crop expected early in 2012. South Korea has bought 110,000 MT of optional origin feed wheat, possibly Australian, presumably misplacing corn in the ration. Ukraine exporters will have had a busy day on the phones trying to get some wheat sales on. Grain exports in the current marketing year could double thise of 2010/11 now that the export duty has been lifted on wheat and corn. Europe's corn crop will be a record 63.4 MMT say Strategie Grains, more than 13% up on last year. 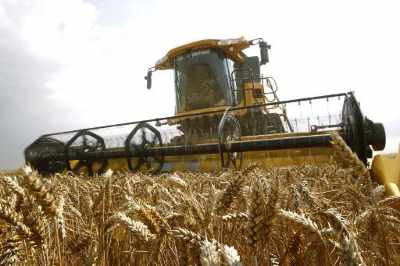 They also raised their EU-27 soft wheat production estimate for 2011 by 200,000 MT to 129.2 MMT and forecast cereal plantings for the 2012 harvest to increase by 700,000 ha. The USDA report weekly export sales of 1.85 MMT for corn, which was actually lower than the 2.0-2.5 MMT expected with China being confirmed as taking 900,100 MT. Soybean sales were 594,700 MT, below the 850 thousand MT to 1 MMT anticipated, although China did show up taking 331,000 MT of that. Wheat sales were also below trade ideas at 399,400 MT. The markets remain nervous on the conflicting vibes coming from European leaders ahead of the weekend summit. 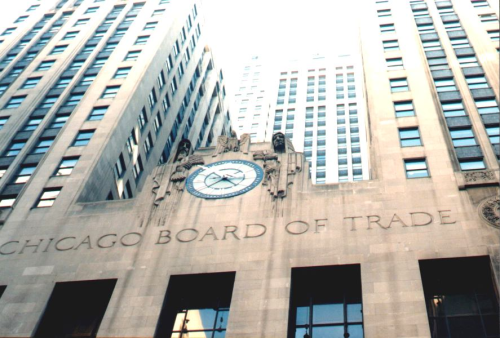 Early calls for this afternoon's CBOT session: wheat up 1-3 cents, corn flat to 1 cent firmer and soybeans mixed. 20/10/11 -- It's not a joke, I really am doing year planners etc as a little sideline again this year. 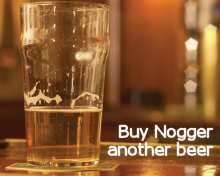 So if you've never got around to buying Nogger a pint, or don't have a PayPal account, you can still make an inadvertent donation to the "buy Nogger a beer" fund and get something in return for your trouble. It's a win win situation! The most common choice of size is A2 folded into A4 for ease of posting but other sizes are available on request. Min order size is 250. These things are customizable so you can put in things like when various local/national agricultural shows are on, or the date of your AGM etc. 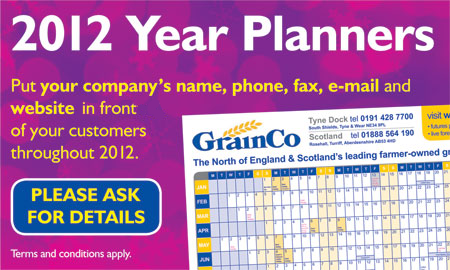 Email me for a quote including all artwork, printing and delivery to your premises in time to beat the Christmas rush. 20/10/11 -- It's all looking a bit sloppy this morning as France and Germany appear to be at odds over how to tackle the European debt crisis rather than all singing from the same song sheet. Add to that the Ukraine President finally finding his pen and passing the bill to lift export duties on wheat and corn, which I think could be a very significant development indeed. We've seen front month Paris wheat fall EUR63.25/tonne and London wheat by GBP49.10/tonne since Russia announced it's intention to lift it's export ban. Subsequently they've largely had the market pretty much to themselves with Ukraine's exporters sitting on their hands and shipping only around 4 MMT so far this season. Not any longer. Whilst the revised Ministry forecast of grain exports totalling 27 MMT released yesterday looks optimistic, monthly shipments of around 2.5 MMT are achievable. With eight months of the marketing year remaining it's possible therefore that foreign sales could hit 24 MMT in 2011/12 - close to the all time record 24.7 MMT shipped out in 2008/09. As we saw back then, price is a secondary consideration when you're hungry for dollars. This afternoon's USDA weekly export sales report will be interesting. Not only have China failed to show up as a confirmed buyer of US soybeans this week, we now have rumours of them actually cancelling shipments, not booking them. Meanwhile Strategie Grains have increased their forecast for this season's EU-27 corn crop to a record 63.4 MMT, well above the USDA's current estimate of 61 MMT. 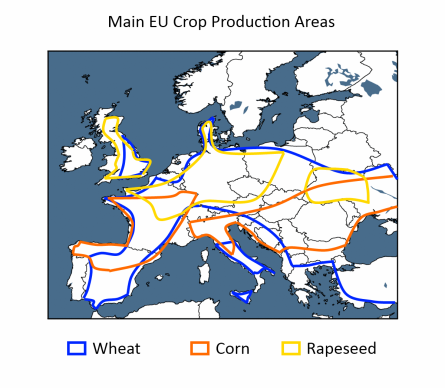 The French analysts also see 700,000 extra hectares going into EU grain plantings for the 2012 harvest, with half a million of that coming from set-aside land being brought back into production. Corn: Dec 11 Corn closed at USD6.38 1/2, down 5 1/2 cents; Mar 12 Corn closed at USD6.48 1/2, down 4 1/4 cents. Funds sold an estimated 8,000 lots on the day on worries that this weekend's meeting of EU financial leaders may prove to be just another false dawn. Unlike soybeans though corn has more of a supply/demand story to rely on, with tomorrow's weekly export sales report from the USDA forecast to be the largest for corn since early 2008 at 2-2.5 MMT, including last week's sales of 900,000 MT to China. Farmer selling remains light with the US harvest only halfway done so far. Ukraine finally lifted it's export duties on corn sales. Wheat: Dec 11 CBOT Wheat closed at USD6.19 1/2, down 5 3/4 cents; Dec 11 KCBT Wheat closed at USD7.05 1/2, down 6 cents; Dec 11 MGEX Wheat closed at USD9.11 1/2, up 5 cents. Minneapolis continues to lead, widening the gap between it and Chicago wheat to almost USD3.00/bushel. News that Ukraine's President finally signed the bill to lift export taxes on wheat and corn is bearish, as too is their stated intent to ship 27 MMT of grains in 2011/12. Dry weather has returned to the US Plains, slowing winter wheat planting progress. Trade estimates for tomorrow's weekly export sales report from the USDA range from 450 to 600 thousand MT. 19/10/11 -- EU grains ended mixed with Nov London wheat up GBP0.70/tonne to GBP147.40/tonne and Nov Paris wheat climbing EUR0.25/tonne to EUR186.00/tonne. Fresh news was difficult to come by for most of the day. Ukraine's Ag Minister raised his forecast for 2011/12 grain exports by 2 MMT to 27 MMT - a level if achieved that would almost certainly put the efforts even of neighbouring Russia's into the shade for the current season. Added to the potential of Russia and Kazakhstan that would give us something approaching 65 MMT of grain coming out of the three FSU nations during the current marketing year - over than 10 MMT more than the USDA currently project. In breaking news late in the day (probably too late for the market to react), Ukraine President Viktor Yanukovych finally ratified a proposal agreed in parliament almost a fortnight ago to remove the export duty on wheat and corn. That could well open the Black Sea floodgates a whole lot wider now, as Ukraine have exported less than 4 MMT in the period Jul 1st - Oct 17th as sellers sat on their hands waiting for this precise moment. In other news, timely rains appear to have rescued wheat crops in SE Australia, which when added to the potentially bumper crops in Western Australia state, mean we could be in for a record production year this season. It's already been widely reported that they were likely to have a record volume of wheat for sale Down Under in 2012 given the large (low grade) carryover still in storage from the last harvest. It now looks like there's the possibility of Australian growers bringing in the largest wheat crop in their history to add to those stockpiles. 19/10/11 -- The overnight grains were mixed, mostly a tad higher with wheat up 2-4 cents, corn 2-3 cents higher and beans flat to 2 cents lower. In a desperately uninspiring market it seems that everything is on hold waiting to see what will come of this weekends summit of EU financial leaders. France and Germany are said to have struck a deal to increase the bailout fund to EUR2 trillion, although exactly where the money is going to come from is unclear. Is this a real EUR2 trillion or a smoke and mirrors Monopoly money EUR2 trillion? Even so, it might sound like a lot but is it enough? Relative minnows Greece have EUR330 billion of outstanding debt on their own with Italy's and Spain's coming in at a combined EUR2.5 trillion. And those figures don't include the knock on effect of how many times those billions and trillions have been passed around the room. As well as everyone in Europe owing money to everyone else in Europe we've also got other countries exposure to European debt too. In the case of the UK for example (as at the end of March 2011) the US was exposed to $715 billion (EUR516 billion) of UK debt - more than any other nation. Out of interest Japan and Australia also featured in that particular league table in seventh and eight position. If we're talking about a game of musical chairs then there's maybe twenty or so big players circling the room and only one chair in the centre, the most that is likely to come out of this weekend's summit is that there'll be two chairs in the middle of the room on Monday. Let's hope the music keeps playing, because it's going to get very messy if and when it stops. Early calls for this afternoon's CBOT session: wheat up 3-5 cents, corn up 2-3 cents and beans flat to 2 cents higher. 19/10/11 -- On a desperately dull no news sort of a day everybody's favourite pasty purveyor Greggs are to start opening up at motorway service stations I read on the BBC here. 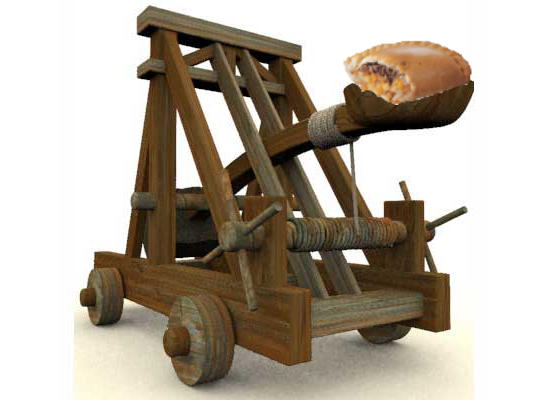 MrsN#1 was no stranger to the pie counter at Greggs that's for sure. She went away to stay at her sisters once and I pulled this cracking bird down the pub and took her back to the house. Of course when we got there this bird took one look at a picture on the mantelpiece and said "you cheeky sod, that's you and your missus and two kids there isn't it, you told me you were single." Thinking on my feet I replied "yes, it's all very sad she's passed away." Of course her little heart melted, as I knew it would, and she was mine. In the morning she said "it must be really difficult for a working man, bringing up two children on his own like that and this place is immaculate, I really admire you, how do you do it?" I said "nah, it's not been that hard so far, she only died yesterday and the kids are staying at their Grans this week." 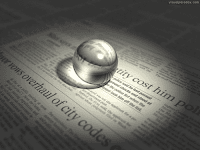 19/10/11 -- Spain has had it's debt rating cut two notches by Moodys with a negative outlook attached. Argos has reported a 71% fall in half year profits saying that sales of electronic items have been particularly hard hit. The average Joe in the street is clearly tightening his belt and putting his plans for a widescreen surround sound home cinema on hold. The minutes of the Bank of England's MPC meeting show that they all voted in favour of QE this month, although there were different ideas on the amount needed. That's a pretty sharp turnaround from September when only one committee member wanted further QE. Incredulously the minutes also show that they reckon that there is "little further upside" in the outlook for inflation. The Guardian is reporting that France and Germany have struck a deal to increase the eurozone's rescue fund from EUR440 billion to EUR2 trillion ahead of this weekend's summit of EU financial leaders. They obviously think that they are going to need it. And they are. A 48 hour general strike is underway in Greece. Ukraine's Ag Minister says that the country will export 27 MMT of grains in 2011/12 despite the fact that it's only shipped out less than 4 MMT in the first three and a half months of the campaign. He'd better nip round the the President's office pretty sharpish with a pen then. With bumper production also expected in Western Australia we could be in for a record wheat crop this year. Abares currently peg production at 26.2 MMT, marginally behind last season's record 26.3 MMT, yet output in WA this year is seen doubling. 18/10/11 -- Soybeans: Nov 11 Soybeans closed at USD12.50 3/4, down 2 1/4 cents; Jan 12 Soybeans closed at USD12.56 1/4, down 4 1/4 cents; Dec 11 Soybean Meal closed at USD324.30, up USD1.30; Dec 11 Soybean Oil closed at 52.70, down 20 points. Considering that beans finished the overnight session 20-25 cents lower this was a fairly impressive performance. US growers are more interested in cracking on with the harvest than selling. News of faltering growth in the Chinese economy was seen as bearish. Weekly export inspections were much better than expected at 45.036 million bushels. Corn: Dec 11 Corn closed at USD6.44, up 3 1/2 cents; Mar 12 Corn closed at USD6.52 3/4, up 1 1/2 cents. Corn managed to turn around from trading in red for much of the session with funds buying an estimate 7,000 contracts on the day. Corn weekly export inspections were poor at 21.172 million bushels. As with beans producer selling is light for the time being, although that could change once the harvest is in. The market is expecting another robust set of weekly export sales on Thursday, with China likely to feature heavily. Wheat: Dec 11 CBOT Wheat closed at USD6.25 1/4, up 1 cent; Dec 11 KCBT Wheat closed at USD7.11 1/2, down 2 3/4 cents; Dec 11 MGEX Wheat closed at USD9.06 1/2, up 10 3/4 cents. Minneapolis was again the leader. Weekly export inspections were so so at 16.359 million bushels. Funds hold a hefty short position in CBOT wheat which is underpinning the market even though the US continues to miss out on a series of high profile wheat tenders, the latest being from Iraq who bought a combo of 350,000 MT of Russian, Canadian and Australian wheat on Monday. 18/10/11 -- EU grains finished mixed with Nov London wheat falling GBP0.90/tonne to GBP146.70/tonne and Nov Paris wheat climbing EUR1.25/tonne at EUR185.75/tonne. London wheat remains within less than a pound (and in the case of Paris wheat within EUR2.50/tonne) of the lowest close for a front month since July 2010. 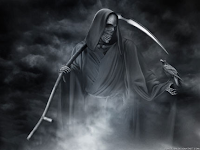 As ever it was the same old scenario of European debt weighing, with Moody's warning France of a negative outlook to its credit rating and Goldman Sachs announcing a near USD400 billion Q3 loss, saying that it has been "significantly impacted" by the problem. Slowing Chinese economic growth is also a concern. UK customs data shows our wheat exports totalling just 163,000 MT in August, nearly 20% below 2010 levels. That brings cumulative 2011/12 year-to-date exports (Jul/Aug) to only 279,400 MT - 40% lower than they were at this time last year. Domestic consumers appear more than adequately covered for the time being. Indeed offtake on existing sales is reported to be slack by many merchants. Ukraine's grain exports lag last season by 24% although their Grain Association says that they expect the President to approve their parliament's recent ruling to abolish export duties on wheat and corn "in the near future." 18/10/11 -- There's no sign of the fabled "turnaround Tuesday" so far with the overnight grains finishing sharply lower with beans leading the way. They ended up shedding around 22-25 cents to make a 40+ cent loss on the week so far. Corn and wheat both finished the overnight session around 8-10 cents lower. Risk aversion seems to be back on the agenda with global stocks declining as market optimism for decisive action to halt the European debt crisis wanes. Goldman Sachs have just announced a near USD400 billion Q3 loss, saying that it has been "significantly impacted" by the problem. China's growth slowed in September and Moody's are warning France of negative outlook to its credit rating to add to world jitters. Crude oil is weaker and the US dollar firmer. The US corn and soybean harvests are progressing well, with both ahead of the five year average. For beans in particular the market is disappointed to find that the USDA haven't confirmed any of the rumoured "volume sales" to China in the past few days. Attention is already switching to South America where Celeres report 10% of the Brazilian soybean crop is planted. The Argy Ministry on Friday reported corn planting progress at 32% complete. Recent heavy rains will have helped winter wheat production potential there. Ukraine's Grain Association says that they expect their parliament's recent ruling to abolish export duties on wheat and corn "in the near future." So far this marketing year they've exported less than 4 MMT of grains, 24% down on last year despite a sharp rebound in production and a bumper corn harvest on the way. There's talk of the CFTC proposing some new legislation on position limits later today. Similar moves could also be on the cards here in unregulated Europe at the forthcoming G20 meeting early next month is the word on the streets. Open interest in front month November Paris milling wheat currently stands at over 8 MMT despite the fact that the contract expires in little more than three weeks. 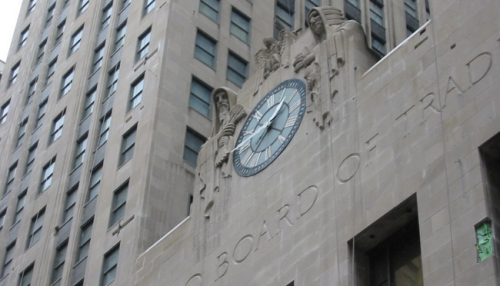 Early calls for this afternoon's CBOT session are in line with the overnight closes: beans 20-25 cents lower, wheat and corn down 8-10 cents. 18/10/11 -- Where do I start? UK CPI inflation is now at it's highest since they came up with the idea in 1997, rising to 5.2% in September from 4.5% in August. A hefty rise in just one month and a sign of things to come methinks. The old fashioned measure of RPI rose to 5.6% - the highest since 1991. Don't panic though, Mervyn King assures us that he's got everything under control and inflation will start to fall again in 2012. Except he hasn't and it won't. Moody's have warned France that they face a ratings outlook downgrade from their current AAA status. No surprises there then given their exposure to Greek, Italian and Spanish debt. News that China's economic expansion slowed in Q3 may confirm that the debt crisis in Europe is having a knock-on effect elsewhere around the globe. The grain markets are feeling nervous with the overnight Globex trading around 20 cents lower on beans and 6-8 cents weaker on wheat and corn. London wheat is GBP0.90/tonne lower on front month Nov, with Paris wheat down a euro or so and Paris rapeseed in the region of EUR4.00/tonne weaker. G20 chair France say that speculation in commodities, biofuel production and land use issues will be on the table for discussion at their forthcoming meeting at the beginning of November. We may see a bit more money taken off the table in the run-up to that one then. 17/10/11 -- Soybeans: Nov 11 Soybeans closed at USD12.53, down 17 cents; Jan 12 Soybeans closed at USD12.60 1/2, down 18 cents; Dec 11 Soybean Meal closed at USD323.00, down USD4.60; Dec 11 Soybean Oil closed at 52.90, down 64 points. 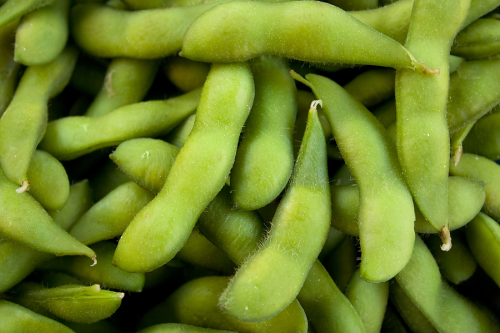 Soybeans fell on disappointment that the USDA failed to confirm any of the recent heavily rumoured sales to China. Comments out of Germany urging the markets not to expect too much from this coming weekends meeting of EU finance ministers also poured cold water on hopes for some concerted and decisive action to arrest European debt problems. Funds sold an estimated 4,000 soybean contracts on the day. After the close the USDA pegged the soybean harvest at 69% complete, 8 points ahead of the five year average, although a little lower than expected. Corn: Dec 11 Corn closed at USD6.40 1/2, up 1/2 cent; Mar 12 Corn closed at USD6.51 1/4, down 1/4 cent. There was very little change from corn as you can see, with funds said to be net buyers of 3,000 contracts on the day. 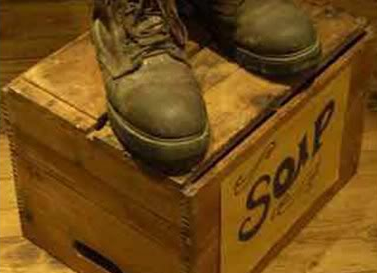 Weak soybeans and a lack of cohesion coming out of Europe were bearish influences. Last week's strong export sales and the likelihood of another robust week this week when recent sales to China get factored in are supportive. After the close the USDA pegged the corn harvest at 47% complete, better than expected, seemingly signifying that US farmers switched some of their harvesting attempts away from beans this past week. The five year average is 41%. Wheat: Dec 11 CBOT Wheat closed at USD6.24 1/4, up 1 1/2 cents; Dec 11 KCBT Wheat closed at USD7.14 1/4, up 6 3/4 cents; Dec 11 MGEX Wheat closed at USD8.95 3/4, up 3 1/4 cents. There wasn't a great deal of change out of wheat today either. Funds featured as modest buyers in Chicago booking 1,000 contracts on the day, although their sizable short still remains. That's supportive whilst they seem reluctant to press the downside for more. Iraq bought 350,000 MT of wheat, although none of it was US origin, with the order being split between Russia (150,000 MT), Canada (150,000 MT) and Australia (50,000 MT). 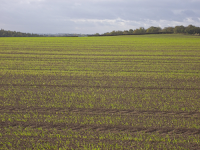 After the close the USDA announced that 73% of winter wheat has now been planted and that 44% of the crop has emerged. Both are now only a little behind schedule (77% and 51% respectively). 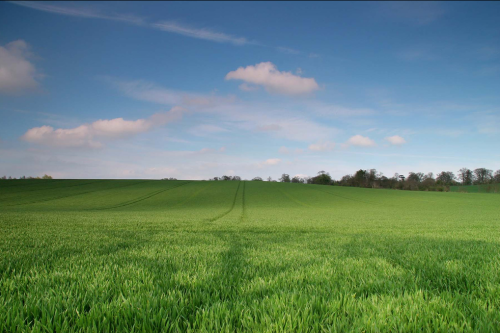 17/10/11 -- EU grains finished mostly a little higher to start the week with Nov London wheat up GBP0.90/tonne to GBP147.40/tonne and Nov Paris wheat down EUR0.25/tonne to EUR184.50/tonne. Fresh fundamental news was thin on the ground. Russia says it may introduce grain export duties, but only once it has dumped 23-24 MMT of cheap cereals onto the market which probably won't be until around March. Kazakhstan meanwhile has almost completed it's bumper grain harvest and could export up to 13 MMT of it's own this season. Most of that will be wheat out of what seems likely to be a post-Soviet era 21 MMT crop - 2 MMT more than the USDA forecast. Ukraine's silos are groaning under the weight of it's 2011 grain harvest awaiting the president's signature on parliament's proposal to scrap export tariffs on wheat and corn. Harvesting of the latter is approaching the halfway point producing 9 MMT to date. Meanwhile northern areas of Western Australia's wheat belt are on track for record production with harvest already under way and in NSW some crops are described as "the best I've seen" by one Department of Primary Industries district agronomist. Early stock market confidence in some sort of progress on the European debt issue when EU finance ministers meet over the weekend was based on comments using words like "decisive" and "clear answers" from the French finance minister. Unfortunately those hopes were quickly dashed when Germany warned against "unrealistic expectations" from the meeting. Once again the lack of unison amongst the two leading protagonists trying to solve the crisis is quite alarming. An ECB statement regarding Greece now said that no economic improvement is expected before 2013, adding that "the achievement of the fiscal target for 2011 is no longer within reach." Early strength in the euro soon dissipated as investor optimism was dashed on the rocks once again. 17/10/11 -- The overnight grains were mixed with beans around 13-15 cents lower, corn 1-3 cents weaker and wheat mostly 1-2 cents firmer. Crude was trading higher in morning exchanges but has slipped into negative territory now that Germany has warned against placing too much optimism on this weekend's meeting of EU finance ministers. That's set the euro back and firmed the US dollar a little. The USDA will report after the close on harvest progress, with soybeans likely to be around 70% done and corn up to around 40% or so complete. As ever, the market is already starting to look to South America before the US harvest is even over. In Brazil it's estimated that around 7% of the planned soybean area has so far been planted. With beans having gained over a dollar a bushel last week and corn 40 cents, we may be in for a bit of profit-taking amidst harvest pressure to begin the week. Direction after that could be decided by the vibes coming out of Europe. With wheat having gained the least last week, that may start the week the strongest leg of the three. The size of the fund short in wheat may also limit the downside for the time being. Early calls for this afternoon's CBOT session: beans down 10-15 cents, corn down 2-3 cents and wheat 1-3 cents firmer. 17/10/11 -- No more than a few hours after the financial markets opened higher on yet another "renewed optimism that EU leaders will sort out the financial crisis at the weekend" than they turn lower after German officials "warn against unrealistic expectations" - says the BBC. Indeed they are now saying that they're not really sure that they've spelled the words "cunning plan" correctly and that their plan, such as it is, may not be ready by the weekend after all. Clearly Angela Merkel must have left it on the bus or something. What wretched bad luck after they'd put all that effort in too. "I'll take your concrete cunning plan, please." "I think it's a bit less concretey than you'd like it, Sir." "I don't care, I'll have it anyway." (Expletives removed for the ladies). "Oh, I'm sorry Sir the cat's just run off with it." "Not much call for them round here." "Not at the weekend, Sir." "Shut that bloody bouzouki up!" 17/10/11 -- The Kazakhstan grain harvest is 98% complete say the Ministry there, producing 27.6 MMT in bunker weight and with yields up almost 100%. That suggests that the recent Ministry estimate for a clean weight crop of a post-Soviet record 25 MMT is pretty much spot on. (And explains why these guys were looking rather pleased with themselves when I met them in Kiev back in the summer). With 85% of the planted area this year given over to wheat that suggests a wheat crop of around 21.25 MMT this season, 2.25 MMT more than the USDA's latest prediction. A report on Reuters today says that the country's state-owned grain trading company pegs export potential at 13 MMT this season. If 85% of those exports were wheat then that would equate to a tad over 11 MMT, 2.5 MMT more than the USDA project. How Many Bleedin' Times Is This? You will be entirely unsurprised to hear that it's on hopes that EU leaders will finally get their sorry fat useless backsides into gear and come up with something, a bit of paper to wave in front of the TV cameras, anything, to say "look we know what we are doing, and we've all agreed on a plan and we're going to stick with it and be proactive and sort the bleedin' European debt crisis out once and for all." This momentous event is expected to take place this weekend. Throw in the words "decisive" and "clear answers" from the French finance minister and everything looks great doesn't it? On paper. Except that I don't think that many really think that Europe's debt problems are going to get sorted quite that easily somehow. 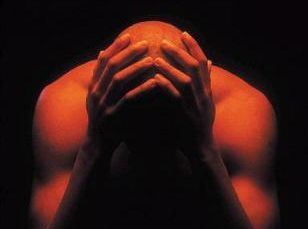 Delaying the inevitable is more likely to be what this weekend's meeting is all about. Meanwhile the grain markets are destined to be left in limbo for another week it seems.